You never know what kind of adventures you'll have until you get out there and try something. In my case, it meant crawling off of You Tube and Facebook and diving half-heartedly back into World of Warcraft. 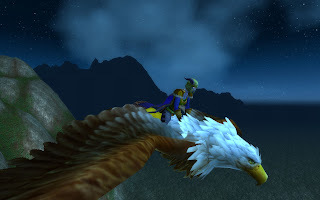 I'll admit it: my first endeavors into Warcraft weren't fun. I was playing it to keep in touch with friends with a bare comprehension of the game that carried me through to Level 45; my previous MMO experience (Final Fantasy XI) was a vastly different animal compared to WoW, but it was worth it to try and keep connected with people I didn't get to see that often. 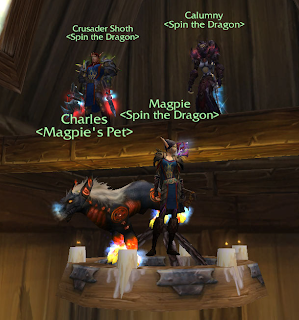 At some point -- I don't quite remember when -- they all left and I was still puttering around in an empty guild. I cancelled my account, left my poor little hunter to rot in cyberspace, and went back to some good ol' fashioned console gaming. FFXII came out around that time and the combat mechanics were very much like running a one-person MMO to me, so I enjoyed it right to the very end. Fall Out was also exceptionally good, as was Bioshock, and earlier on, Portal. I convinced myself that I really didn't need to play an MMO at all, much less Warcraft, which I did not enjoy. Still, something about console gaming wasn't as satisfying any more. Then I realized what I was missing: it wasn't so much the game, but the people. It occurred to me that I stopped enjoying WoW when my friends -- my guild -- more or less drifted off to play other games and other things. One of my old guild mates (and a good friend of mine), casually mentioned to me that he switched servers and I should come and join his guild. I was reluctant about it at first. I didn't know any of them, after all, and while I trusted his taste and judgment, I wasn't convinced it was worth picking up again. Well, he said, why not level your hunter to 55 and make a death knight to come meet the guild? After all, Magpie was only ten levels away. So when I received an email from Blizzard about their free week of playtime in celebration of their anniversary I tentatively agreed and began to play again. I should clarify: I did not expect to enjoy World of Warcraft. And for the week I played, I almost gave it up again. I didn't make it to 55, my own server was awful, and I still had no idea what I was doing. Everyone I talked to was doing Lich King content while I was still without the expansion and just now getting to Burning Crusade. The one thing that really saved my hide and added another subscription to Blizzard's millions was the newly installed Random Dungeon Finder. Even though I was still guildless at that time, it gave me the ability to level and do something different that would have otherwise left me grinding and questing forever. I began seeing content I never experienced before and regained some sense of hope -- and slowly, I began to level. And then came the moment: I bit the $55 bullet and switched factions and servers. I found myself amongst the company of strangers in on the Sentinels server. The person who convinced me to do all this, and the same friend who dragged me back into the game, was Yaran, one of their main tanks and officers. He convinced me that this was a Good Idea; I wasn't so sure. Ultimately, it ended up being one of the best choices I made about gaming (and, in some ways, about my life), in a very long time.